1.- The Spanish lyric has been considered the oldest in Romance Europe, since the discovery of the kharjas. These were written in Mozarabic dialect -a variation of Romance, derived from Latin- with Hebrew or Arabic characters. They are the core and end of the "moaxajas", poems widespread throughout the Iberian peninsula written in Semitic languages. Samuel Stern managed to decipher the first ones, in Hebrew poetry, in 1948. These kharjas consist of mainly refrains of two to four verses, sung by women who are calling to their absent lovers. Other times, the poet pays tribute to his patrons, relevant governors, etc. We have some unsigned works from the 10th century and others signed by identified authors. 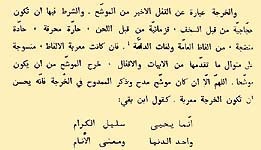 It is assumed that they were written during an earlier epoch - even before the Arab invasion - but the Andalusian muslims were able to understand them and mixed them with words from their own language. For this reason it proved difficult for the modern philologists to decipher them. In the Arab kharjas we find arabisms mixed perfectly intelligibly with Romance phrases. The kjarjas are the oldest lyrical poems of all Romance poetry. a) "cantigas de amigo", compositions in which the verse is repeated, changing only a few words. They are of colloquial origin. c) cantigas de escarnio of ridicule, which satirize well known personalities and events. Among the collections of verse, the Cancioneiro da Ajuda, Cancioneiro da Vaticana and the Cancioneiro da Biblioteca Nacional o de Colocci-Brancuti should be emphasized. The most renowned poets are Martín Codax, Nuno Fernandes, Airas Nunes, the king Don Denís, Xohan Zorro, etc. 3.- Until the 16th century, works were generally collected in Castilian, refrains and short compositions probably derived from longer poems, lost today. Among these we conserve the carols, difficult to date or classify. Ph. D. in Hispanic Philology.